College graduations are being held across the country. They are a time for celebration and remind us of the importance of higher education. During this season, it can be hard to imagine not being able to go to college. But the reality is, college study still remains out of reach for many. Rising college costs can be intimidating, and the weight of mounting debt can turn students away altogether. Fortunately, an educational model exists to help overcome these hurdles: early college high school. Early college high schools are unique partnerships between high schools and colleges that allow students to receive their high school diploma while earning transferrable college credit toward a postsecondary degree. Perhaps most important, early college programs are available at no cost to students and families. There are approximately 300 early college high schools nationwide, and 14 in Ohio. Research conducted by Columbia University shows that early college participants are significantly more likely to complete high school, enroll in college, and earn college degrees. In addition, early college high schools save money for students and their families by allowing students to complete up to two years of college credits while still in high school. These savings range from approximately $27,200 up to $72,600 for two years of college tuition at public and private colleges, respectively. In Ohio, we’ve seen the success of these programs firsthand. Founded in 2013, the Dayton Early College Academy (DECA) was Ohio’s first early college high school program. DECA operates as a nontraditional charter high school and has served 465 students in its first full school year. In 2014, 100 percent of DECA’S graduates were college-bound or serving in the military, and 95 percent of the graduates entered Ohio colleges or universities. Ohio’s newest program, Bard High School Early College, opened in Cleveland in 2014. Bard grants students a high school diploma and a two-year college degree (or up to 60 transferrable college credits) and has more than 130 students enrolled this year. Simply put, early college works. More students have access to a college education because of these programs. Although free to students and families, school districts often cannot support early college programs due to tuition costs, causing program instability. So, we introduced the Go to High School, Go to College Act to expand education opportunities to more young Americans and support school districts and programs. Specifically, our bill allows low-income students enrolled in early colleges to use Pell Grants to help pay for college while maintaining accountability. This way we can work to ensure every dollar spent on earned college credits protects students and increases the effectiveness of the Pell Grant program. Our bill also helps early colleges become more sustainable across the country and encourages more school districts and higher education institutions to develop similar programs. We know Congress can and should do more to help students get to college. Based on proven models of success, the Go to High School, Go to College Act is commonsense legislation to allow more students access to higher education. A lack of financial resources should not prevent America’s students from achieving a college degree. So, as we celebrate the class of 2015, let’s look forward to the next generation. Let’s give every student a chance to walk across the stage. Rep. Marcia L. Fudge (D-Ohio) is Ranking Member of the House Subcommittee on Early Childhood, Elementary and Secondary Education. 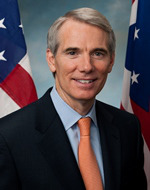 Senator Rob Portman (R-Ohio) is on the Committee on Finance.